Next week is an exciting week for Food Processing and our sister brands. The majority of our Food Processing team will be attending the Smart Industry conference Monday through Wednesday. For those who may not know, Smart Industry is a conference that our parent company (and one of our sister brands) puts on every year that tackles the concept of IIoT and digitalizing your technologies and systems. It's a great conference and filled with informative presentations and case studies from others doing IIoT and digitalizing well, as well as a host of networking opportunities. 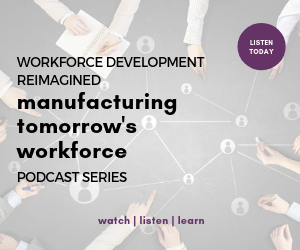 On Thursday, we shift into webinar mode as we talk with Mike Rogers Senior Director, Maintenance & Refrigeration at Tyson Foods, Inc. and Todd Gilliam, Food & Beverage US Segment Leader, ABB Inc. about how to prepare your workforce for digitalization. This is a great event if you're not able to make it out of the office for the day or if you're fresh out of budget for attending seminars. This webinar, like all of our others, is free to attend. All you need is an internet connection and a computer. Check it out and see if it's something you might be interested in.